This fan is solid white in color and is ideal for using as decoration or as a blank canvas to paint your own beautiful design. 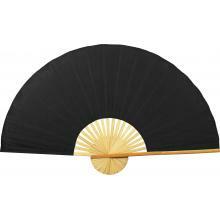 This fan is solid white in color and is ideal for using as decoration or as a blank canvas to paint your own beautiful design. Crafted from rayon and bamboo, this unpainted fan is a pure white color, which has always been associated with pureness and strength in Asian culture. White is also considered to be the color of metal, and therefore symbolizes brightness and achievement. Use this unpainted fan as your very own canvas and personalize it according to your taste. 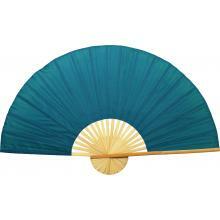 Its clean and crisp style makes this fan very ideal for painting your own design - from intricate florals to expansive seascapes. Do-it-yourselfers and creative folks will surely love this unpainted white Asian fan which can be easily customized to fit varying tastes. Bring a dash of Oriental flair to your home or gift someone with an Asian fan which you&apos;ve personalized to near perfection; this Solid White Unpainted Fan is a must for every aspiring artist who wants to try their hand on a new type of canvas! Quick delivery. Item as described. Thank you! Confirming I received the shipment today . . . and I am thrilled! Thank you for incredible customer service. The order arrived well and in perfect way. The quality was very nice and arrived in a timely manner.